Steloo has broken new boundaries with his latest live art performance in Accra. The experimental house DJ, sound and fashion artist has taken his idiosyncratic shows all over the world but chose home to present this special concert to a select audience of fellow mavericks. 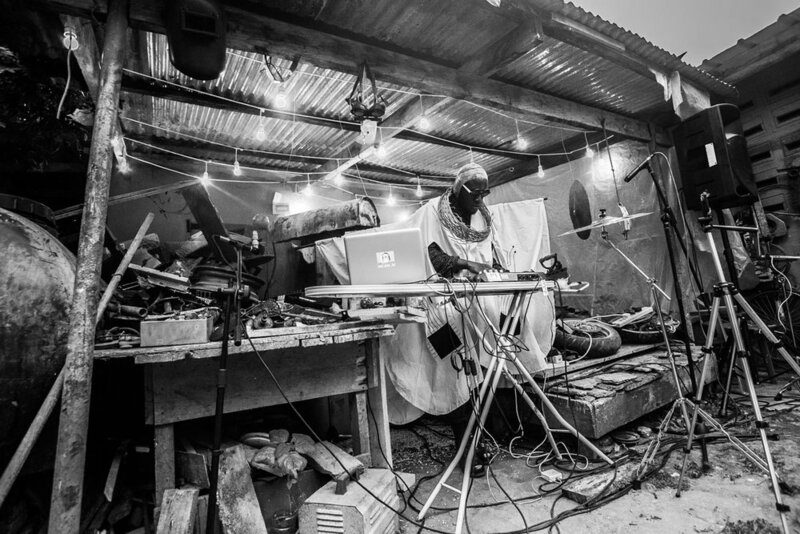 The concert saw him fuse electronic synths with traditional cymbals, xylophone and conga and play with sonics created with household and found items such as glasses, spoons, tin cans and scrap metal. The event was a collaborative curation with multi media artist Nana Anoff and aimed to build an interactive, audio-visual landscape. Steloo’s performance was heightened further by his attire, a dramatic cloak made especially for the occasion by local designer Oscar William Haute Couture, which featured an extended silhouette covered in circuit board embroidery. Having banned social media during the show, Steloo now releases a short film documenting the intimate experience. You can also listen to the full audio of the set on Soundcloud, and read our previous interview with Ghana’s most head turning creatives, including Steloo, here.